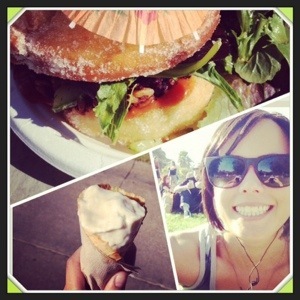 Recently I had two great food adventures in San Francisco. The main thing these two places had in common is that I sought them out purposely after reading rave reviews about each. I highly recommend both, as they offer opposite dining experiences. The Millennium restaurant on Geary Street features an upscale atmosphere with romantic low lighting and carefully selected decor. My date and I ordered two appetizers, both of which were delicious! 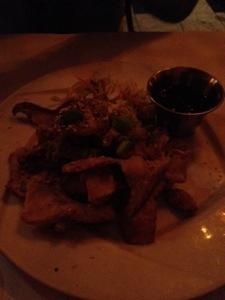 The deep fried trumpet mushrooms mimicked calamari quite well, whether that was the chef’s intention or not. Another dish I’d recommend is the tamale, it had a fantastic sauce over a perfectly crafted dish. While all their desserts sounded tempting, the unseasonably warm night prompted us to order the trio of sorbet and ice cream. A perfect ending to the meal! My main criticism would be that the restaurant’s temperature was quite warm and the tables close together, I could almost rub elbows with the diners on either side of me! Also, almost every dish has mushrooms in it, so if you are allergic or don’t like them then this is probably not the place for you. Overall, a great date night spot! The second food adventure took place just this past weekend when I went to Dolores Park specifically to try out Hella Vegan Eats‘ cuisine and celebrate the grand opening of their food truck. It was a beautifully sunny day, ideal for lunch in the park! Hella Vegan Eats has a special permit that allows them to park their food trailer inside the park rather than on the streets bordering it. All of their menu items looked tasty, but I was on a mission to try the often written about Doughnut Burger Supreme! It was an unusual combination, with a bun made of sugar doughnuts and a patty made of kamut and beets, but quite delicious. The spicy sauce really brought all the flavors together and the fresh greens cut through some of the sharper tastes. I really want to try the rest of their menu! If you’re looking for a relaxing picnic lunch in the park, this is the place to go. With so many food choices in San Francisco, these are just two options! Both offer an appealing atmosphere to enjoy their tasty dishes in. Depending on what you’re looking for, either can deliver on a fun filled time with excellent service and memorable food.